The Flathead Indian Reservation is located north of I-90 between Missoula and Kalispell. Fertile valleys and towering mountain peaks surround the 1.2 million acres of the reservation. The reservation is home to the Confederated Salish and Kootenai tribes. The tribes are a combination of the Salish, the Pend d'Oreilles, and the Kootenai. There are approximately 6,800 enrolled tribal members; and about 3,700 live on or near the reservation. Timber industry sales and Kerr Dam are sources of income for the tribe. The tribes also own the Kwataqnuk (which means, "where the water leaves the lake") Resort Hotel and the S&K electronics manufacturing facility. The Salish-Kootenai Community College is located in Pablo. The college offers two- and four-year degrees. The Kootenai, Salish and Pend d' Oreille are native to the state. Archaeological evidence shows that native Americans inhabited Montana more than 14,000 years ago, and artifacts indicate that these tribes have roots in the area's prehistory. 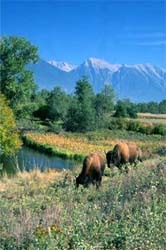 The Kootenai inhabited the mountainous terrain west of the Continental Divide, venturing only seasonally to the east for buffalo hunts. The Kootenai were divided into two main groups. One band lived to the northeast and had a lifestyle based on bison hunting. The other band lived in the mountainous west and had a lifestyle focused on rivers and lakes. The Salish occupied territory in Washington, Idaho, and western Montana but ventured as far east as the Bighorn Mountains. As the tribe moved east, it had to change from a lifestyle based on salmon fishing to one more dependent on native plants and buffalo. During the 1700s, these two tribes — the Salish and the Kootenai — shared common hunting and gathering grounds. Later, Christianity, in the form of Catholicism, heavily influenced the Salish. The effect of the Church played a major role in keeping western Montana relatively peaceful during the Indian wars. With the signing of the Hellgate treaty, the massive traditional lands of the tribes were reduced to the fertile grounds of the Flathead Reservation.